Cottonwood Post-Acute Rehab website is maintained as a service to its clients (“User”). By using this site, the User agrees to comply with and be bound by the following terms and conditions of use. Please review these terms and conditions carefully. If you do not agree to these terms and conditions, you should not use this site. 1. Agreement. This Agreement (the “Agreement”) specifies the Terms and Conditions for access to and use of cottonwoodcare.com (the “Site”) and describes the terms and conditions applicable to access of and use of the Site. This Agreement may be modified at any time by Cottonwood Post-Acute Rehab upon posting of a modified agreement. Any such modifications shall be effective immediately. The User can view the most recent version of these terms at any time at www.cottonwoodcare.com/terms-of-use. Each use by the User shall constitute and be deemed unconditional acceptance of the Agreement. 3. Ownership. 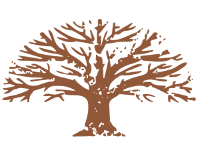 All content included on this Site is and shall continue to be the property of Cottonwood Post-Acute Rehab or its content suppliers and is protected under applicable copyright, patent, trademark, and other proprietary rights laws. Any copying, redistribution, use or publication of any such content or any part of the Site is prohibited, except as expressly permitted in this Agreement. Under no circumstances will the User acquire any ownership rights or other interest in any content by or through the use of this Site. 5. Trademarks/Service Marks. “Cottonwood Post-Acute Rehab” is a trademark, service mark or registered trademark/service mark and logo of Cottonwood Post-Acute Rehab. Other product and company names mentioned on this Site may be trademarks/service marks of their respective owners. 6. Site Use. 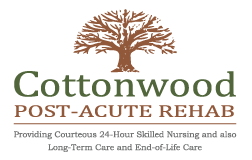 Cottonwood Post-Acute Rehab grants a limited, revocable, nonexclusive license to use this Site solely for personal use and not for republication, distribution, assignment, sublicense, sale, preparation of derivative works, or other use. User agrees not to copy materials on the Site, reverse engineer or break into the Site, or use materials, products or services in violation of any law. The use of this Site is at the discretion of Cottonwood Post-Acute Rehab and Cottonwood Post-Acute Rehab may terminate User’s use of this Site at any time. 8. Links to Third Party Sites. The Site may contain links to other websites (“Linked Sites”). The Linked Sites are not under the control of Cottonwood Post-Acute Rehab and Cottonwood Post-Acute Rehab is not responsible for the contents of any Linked Site, including, without limitation, any link contained in a Linked Site, or any changes or updates to a Linked Site. Cottonwood Post-Acute Rehab is not responsible for webcasting or any other form of transmission received from any Linked Site. Cottonwood Post-Acute Rehab providing these links only as a convenience, and the inclusion of any link does not imply endorsement by Cottonwood Post-Acute Rehab of any site or any association with its operators. 9. Materials Provided to Cottonwood Post-Acute Rehab or Posted on this Site. Cottonwood Post-Acute Rehab does not claim ownership of the materials User provides to Cottonwood Post-Acute Rehab (including feedback and suggestions) or post, upload, input or submit to the Cottonwood Post-Acute Rehab (collectively, “Submission(s)”). However, by posting, uploading, inputting, providing or submitting a submission, User is granting Cottonwood Post-Acute Rehab, its clients, affiliates and necessary sublicensees’ permission to use the submission in connection with the operation for their businesses including, without limitation, the rights to: copy, distribute, transmit, publicly display, reproduce, edit, translate and reformat the Submission; and to publish User’s name in connection with the Submission. No compensation will be paid with respect to the use of the Submission, as provided herein. Cottonwood Post-Acute Rehab is under no obligation to post or use any submission provided and may remove any Submission at any time in Cottonwood Post-Acute Rehab sole discretion. 10. Indemnification. User agrees to indemnify, defend and hold Cottonwood Post-Acute Rehab and its clients, officers, directors, employees, and affiliates, harmless from any liability, loss, claim and expense, including reasonable attorney’s fees, related to violation of this Agreement or use of the Site. 11. Disclaimer. THE INFORMATION ON THIS SITE IS PROVIDED ON AN “AS IS,” “AS AVAILABLE” BASIS. USER AGREES THAT USE OF THIS SITE IS AT USER’S SOLE RISK. THIS SITE MAY INCLUDE INACCURACIES OR TYPOGRAPHICAL ERRORS. COTTONWOOD POST-ACUTE REHAB DISCLAIMS ALL WARRANTIES OF ALL KIND, INCLUDING BUT NOT LIMITED TO ANY EXPRESS WARRANTIES, STATUTORY WARRANTIES, AND ANY IMPLIED WARRANTIES OF: MERCHANTABILITY, FITNESS FOR A PARTICULAR PURPOSE, AND NON-INFRINGEMENT. TO THE EXTENT USER’S JURISDICTION DOES NOT ALLOW LIMITATIONS ON WARRANTIES, THIS LIMITATION MAY NOT APPLY TO YOU. USER’S SOLE AND EXCLUSIVE REMEDY RELATING TO USE OF THE SITE SHALL BE TO DISCONTINUE USING THE SITE. 12. Limitation of Liability. UNDER NO CIRCUMSTANCES WILL COTTONWOOD POST-ACUTE REHAB BE LIABLE OR RESPONSIBLE FOR ANY DIRECT, INDIRECT, INCIDENTAL, CONSEQUENTIAL (INCLUDING DAMAGES FROM LOSS OF BUSINESS, LOST PROFITS, LITIGATION, OR THE LIKE), SPECIAL, EXEMPLARY, PUNITIVE, OR OTHER DAMAGES, UNDER ANY LEGAL THEORY, ARISING OUT OF OR IN ANY WAY RELATING TO THE SITE, USER’S SITE USE, OR THE CONTENT, EVEN IF ADVISED OF THE POSSIBILITY OF SUCH DAMAGES. USER’S SOLE REMEDY FOR DISSATISFACTION WITH THE SITE AND/OR CONTENT IS TO CEASE ALL OF USER’S SITE USE.